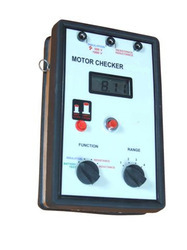 Leading Manufacturer of machine conditioner, digital motor checker, analog motor checker and bearing analyzer from Mumbai. Insulation Resistance (IR) Measurement. Identify open and short circuits/ loose connections in a winding coil. Identify interterm shorts. Detect Rotor bar problems without dismounting the rotor. Inductance of the winding with respect to different positions for rotor for detecting blow holes or cracks in the rotor bars. Simple operations, accurate & quick assessment of motor condition. Shock proofed rubber casting Low battery indication. 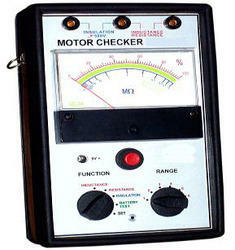 A portable diagnostic tool for Electrical Engineer and is used for quick on site checks of electric three-phase machines. A reduction in machine performance, such as inefficient operation or tripping of overloads, may indicate mechanical or electrical faults. If the fault is electrical, will immediately detect it, without having to dismantle the equipment. It may also be used to check quality and condition of motors which have been in storage before they are installed. The instrument has three separate operating modes to measure different types of fault like fully insulation, open circuits / loose connections, short circuits and rotor defects. Motor insulation is tested with a high voltage of 500V DC supplied by the instrument. 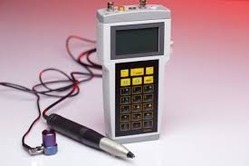 We Present a small Micro Processor based diagnostic tool for comprehensive condition analysis of rotating machinery. Objective measurements of machine condition are needed as a reliable base for preventive maintenance. 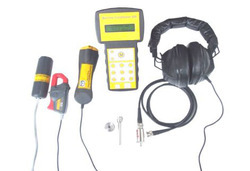 Now maintenance personal can analyze bearing condition, measure machine vibration and check rotational speed - with a single and easy to use instrument. The best way is to periodically monitor bearing condition and replace the bearing at the right time by least influencing the production efficiency. Looking for Monitoring instruments ?